Grand Canyon Facts: Theodore Roosevelt created the Grand Canyon Game Preserve by proclamation in 1906 and the Grand Canyon National Monument in 1908. The Grand Canyon was designated as a National Park by President Woodrow Wilson in 1919. 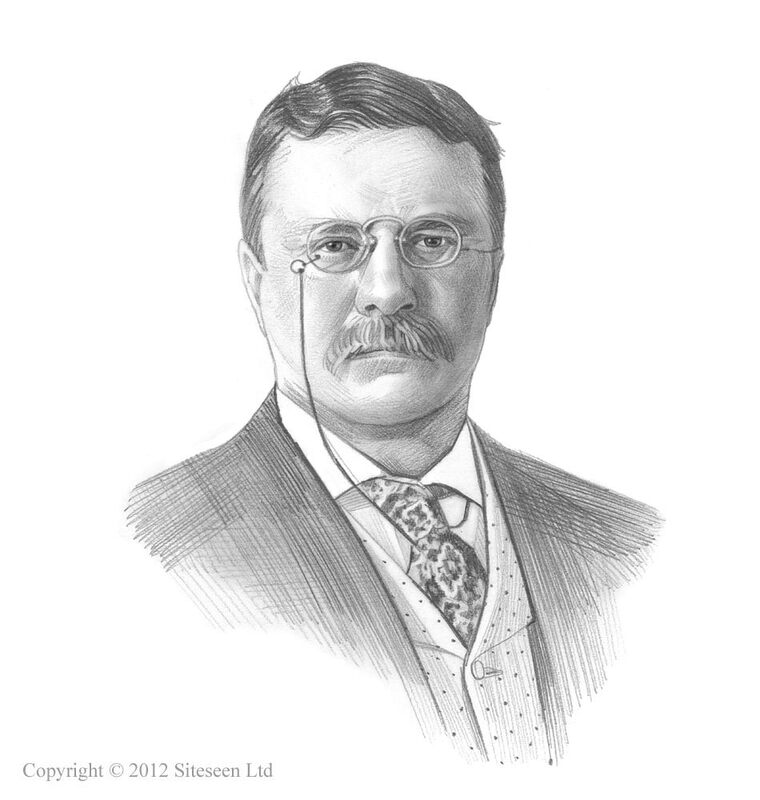 Theodore Roosevelt passed the 1906 National Monuments Act, a law to preserve the heritage of the nation. President Roosevelt created the Grand Canyon Game Preserve by proclamation in 1906 and the Grand Canyon National Monument in 1908. The Grand Canyon was designated as a National Park by President Woodrow Wilson in 1919. Summary and definition: The Grand Canyon is a deep gorge in Arizona, formed by the Colorado River that extends from its junction with the Little Colorado River to Lake Mead. It was cut by vertical river erosion through the multi-coloured layers of the high Colorado plateau. The Grand Canyon is 277 miles long, up to 18 miles wide and it is more than a mile deep. It is referred to as one of the Natural Wonders of the World and attracts over 5,000,000 visitors every year. The Grand Canyon Skywalk was opened in March 2007 and is a horseshoe-shaped, glass walkway that allows tourists to walk 70 feet past the edge of the Grand Canyon wall and stand 4,000 feet above the Colorado River. Interesting info, description and brief facts about the Grand Canyon and the famous Skywalk. This awe-inspiring Grand Canyon National Park is located in the State of Arizona, close to the borders of Utah and Nevada. . The Grand Canyon is important because not only is it one of the Wonders of the Natural World, it is also an important site for geological research due to the many types of rock that are visible. Over 5 million people visit the area every year to enjoy the breath taking scenery and enjoy pursuits such as hiking, sightseeing, rafting, climbing and camping. It is illegal to excavate, relocate, and/or remove fossils from the National Park. Nobody has ever found a fossilized reptile skeleton within the Grand Canyon area although fossil footprints were left by more than 20 species of reptiles and amphibians. The Sipapuni is a natural formation on the Little Colorado River and features in the creation myths of some Native Americans. Sipapuni is the Hopi term for "Place of Emergence". Native American Indian Tribes have occupied the Grand Canyon area for many hundreds of years. The six major Native American Indian Tribes are the Havasupai, Zuni, Hopi, Paiute, Navajo and the Hualapai. The steep sides and slopes abound with the shapes of towers, temples, columns, and pyramids. The north rim rises a thousand feet higher than the South Rim. Because of the vast ranges of altitude and terrain, the Grand Canyon has many climate zones. Temperatures can range from below zero in places to over 100 degrees. The North Rim is only open to visitors in the late spring, summer, and early fall. Skywalk Facts: The u-shaped glass Grand Canyon walkway opened in 2007 and was heralded as feat in engineering. It took 4 years to build the bridge and cost $30 million dollars. stand 4,000 feet above the Colorado River. Definitely not for the feint-hearted! Skywalk Facts: It is 10 feet wide and 70 feet long. The floor and walls are made of glass. The glass walls are approximately 5 to 7 feet high. Skywalk Facts: The fantastic views from the glass walkway attract 2 million visitors per year. Skywalk Facts: The idea was conceived by a Las Vegas businessman called David Jin who obtained agreement from the Hualapai Tribe for the project. Skywalk Facts: Numerous tests were made to ensure its safety checking the strength of the rock and its ability to withstand high winds. Skywalk Facts: 60 to 120 people are allowed on the Skywalk at one time, although it can support 800 people. Interesting info, description and brief facts about the Grand Canyon are detailed in the Geology Fact Sheet. For historical info refer to the Grand Canyon History Timeline. Formation: The canyon was originally shaped by climate changes that created swamps, deserts and inland seas. Formation: The many changes to the environment created many different colored layers of rock, one on top of the other. Geology: There are 12 distinctive multi-colored layers of rock that provide a timeline of the rock formation. The age is measured by indicating the 'my', meaning the number of million years old. The following chart shows the names and the time periods associated with the layers of rocks. The oldest level is the Vishnu basement. Names: Many of the names associated with the Grand Canyon are highly descriptive, other names relate to people or events. Some names are exotic and taken from Hindu, Egyptian, Greek, Norse and other ancient civilizations. Of the 230 place names at the Grand Canyon, twenty-five are Native American names. Vishnu basement: The Vishnu basement layer is about 1,840 to 1,680 million years old, originally consisting of sediments of sandstone, limestone, shale and granite that combined with lava flows to form the schist. The colors of this layer are dark gray or black. Vishnu is the name of an important Hindu deity and means "the Preserver"
Grand Canyon Supergroup: The Grand Canyon Supergroup layer is about 1,250 to 740 million years old. It consists of thick group of basaltic rocks that flowed as lava and deposited on top of the schist and granite.The colors of this layer are dark brown. Tapeats Sandstone: The Tapeats Sandstone layer is about 525 million years old, consisting of medium and coarse sandstone. The upper layer rocks are marked by ripple marks formed by prehistoric ocean waves. The colors of this layer are dark brown. Bright Angel Shale: The Bright Angel Shale layer is about 515 million years old, consisting of mudstone shale and sandstone. The colors of this layer are green, gray, brown and tan. Muav Limestone: The Muav Limestone layer is about 505 million years old, consisting mainly of limestone, separated by layers of sandstone and shale. The colors of this layer are gray. Temple Butte Formation: The Temple Butte Formation layer is about 385 million years old, consisting of purple freshwater limestone in the east and gray or cream dolomite in the west. Supai Group: The Supai Group layer is about 315 to 285 million years old, originally consisting of sediments of sandstone, limestone and shale. The colors of this layer are red, brown and tan. The word Supai is derived from the Havasupai Reservation. Hermit Formation: The Hermit Formation layer is about 280 million years old, and consists of soft shale that have eroded into slopes. The colors of this layer are red and rust. Toroweap Formation: The Toroweap Formation layer is about 273 million years old, consisting of sediments of sandstone and shale. The colors of this layer range from yellow to gray. Toroweap is a Paiute term meaning "dry or barren valley". Kaibab Formation: The Kaibab Formation layer is about 270 million years old, originally consisting of sandstone, and shale. The colors of this layer are cream and grayish-white. Kaibab is a Paiute Indian word meaning "mountain lying down".